Apparently, I have baby on the brain so I'm making tons of baby cards. I should probably find a few more pregnant people to befriend. I'm entering this card in several challenges: Simon Says Stamps Animal Antics, MarkerPop Coloring challenge 5, and Moxie Fab World Minty Fresh challenge. I colored my Lawn Fawn image with Copics. The paper is American Crafts/Dear Lizzie Neapolitan and the ribbon is white wrinkled ribbon from May Arts. I also used a punch to add a little interest. A fabulous card, a great design and gorgeous papers. 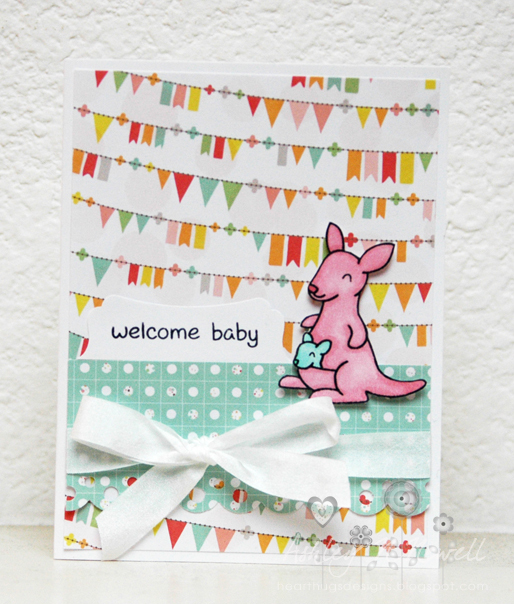 Your kangaroo and baby are adorable!! I adore your pink kangaroo! Too cute! I love making baby cards too, and like you, I need more preggo friends to hand them over to!